Before getting into some of the details about our trip, we decided to start each recap off with a quick overview of the city. First up: Lisbon! When? Monday, Sept 3 – Thursday, Sept 6 (3 nights). While I think this was long enough, I wish we could have stayed one more night – to enjoy more food, not feel as rushed in Sintra and Belém, and to visit attractions that we didn’t have time for. Where? We stayed at the Orange 3 House in the Chiado/Bairro Alto neighborhood area. It was 105 euros per night and included breakfast. We stayed in the top floor room (which we would do again! ), but you can save 10 euros a night by staying in the first or second floor room instead. This B&B only has 3 roooms, and is staffed from about 8am-5pm (but they were able to accomodate other schedules). We absolutely loved it and will definitely want to stay here the next time we visit! If all of the rooms happened to be booked, we would want to stay in the same neighborhood (great night life, close to restaurants, close to areas of interest). Transportation. We arrived and left from the Lisbon airport. We stood in line for a taxi at the airport, but on the way back to the airport we opted to have our hotel arrange a pick-up for us (despite the 2 euro surcharge, the taxi ride was much cheaper on the way back and he picked us up very close to our hotel). We purchased a three-day Lisboa card (more on that in a separate post), which included free transportation. We took advantage of the metro, train, buses, funiculars, and cable cars. Overall they were easy to use and convenient! Food. Lisbon has a lot of seafood, including a lot of bacalhau (salt cod) dishes. Both Ryan and I agree that are favorite meal, based on the food only, was at Sea Me, where we were spoiled with delicious seafood (although no bacalhau). The traditional Portuguese dish with bacalhau or another type of seafood (we tried both octopus and calamari this way) with potatoes, garlic and oil was always fantastic. Overall, the seafood was better than expected and the chocolate cake paired with Port was the perfect indulgence to end our meal each night. Day Trips. We took a day trip to Sintra upon arriving in Lisbon. It’s about a 40 minute train ride from Lisbon to Sintra and definitely worth it. I was worried that with less than three full days in Lisbon we would miss out by going to Sintra, but this wasn’t the case at all. The next time we’re in Lisbon, we plan on spending time in Sintra to see the sites we didn’t have time for, and spend more time exploring some of the already-visited sites. Attractions. There was a lot to do and see in Lisbon. As mentioned above, we spent a day in Sintra. We also spent part of one day in Belém, which has several interesting attractions, including the Monestary and National Coach Museum. One of the best (and cheapest!) 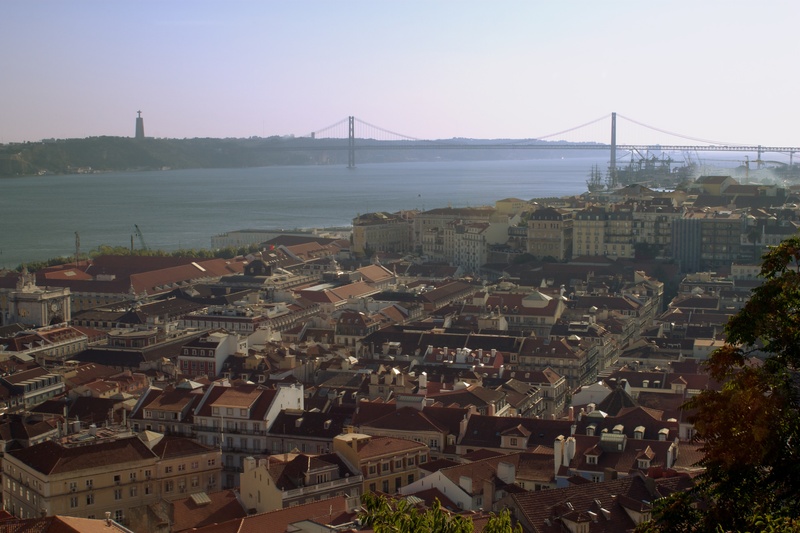 activities is to explore the very walkable neighborhoods in the heart of Lisbon. And finally, Fado is absolutely amazing and a must-see when visiting Lisbon! Ask for recommendations to make sure you find a restaurant with traditional food and an intimate setting. Language Barrier. No issues with speaking English the entire time. Neither I nor Ryan knew one word of Portuguese, so it was comforting to find that everything I’ve heard was correct – the Portuguese (at least in the Lisbon area) speak English extremely well. Cost. Prior to arriving in Lisbon, I had heard and read that Portugal is surprisingly affordable. I agree that it is somewhat affordable – our hotel was amazing and much cheaper than we might expect to spend elsewhere in Europe – but we had no problem stumbling upon expensive restaurants. Our cheapest meal was lunch in the Bairro Alto neighborhood, but even that wasn’t notably cheap. I believe the statement “Portugal is cheap” is more true in smaller cities than it is in Lisbon. Advice. Based on our limited exploration of the city, we found that the Bairro Alto/Chiado is the best area to stay. It was lively after dark and conveniently located close to everywhere we wanted to be. If not in the Bairro Alto/Chiado, the Baixa and the Alfama (which seemed to be the least touristy, but apparently can be a bit “seedy” at night) are great options for staying in the heart of Lisbon. Also, as mentioned above, make sure to experience Fado. We absolutely loved the restaurant we went to, Guarda-Mor, which has Fado on Wednesday nights. Closing comment. We enjoyed our visit to Lisbon so much that we’re determined to plan a longer trip to Portugal in the future. Everyone we met and talked to was so friendly, the food was delicious, the town was beautiful, and there was so much to do and see. On our next trip, it would be great to spend some time in cities other than Lisbon to become better acquainted with Portugal! This entry was posted in City Overview, Travel and tagged Lisbon, Portugal, Portugal/Spain 2012 Trip by Kristin. Bookmark the permalink.